TRD Friday Feature:If there’s any real estate cliché greater than describing a cramped apartment as “cozy,” it may be pointing out how overused and inaccurate the term is. Adjectives like “extraordinary,” “impeccable” and “majestic” are so ubiquitous that instead of conveying the qualities they intend to, they come across as empty industry lingo. Brokers have finally wised up and have phased them out of their listings, according to The Real Deal’s review of more than 9,000 Manhattan listings asking $2 million and up. Using Curbed’s “Brokerbabble Glossary” as a linguistics guide, TRD crawled StreetEasy’s listings database and found that some of the most clichéd listings terms live on mostly in memory. Brokers used nearly 1 million words across the reviewed listings, with the average word appearing roughly 75 times. That puts about a third of the broker babble list – words like “dazzling,” “incomparable” and “quaint” – below average. “Cozy,” appears 124 times, having become less popular with brokers in favor of “proportioned.” The word appeared 905 times in various iterations with brokers adding modifiers like “well-,” “generously-“ and “amply-” for extra pizzazz. 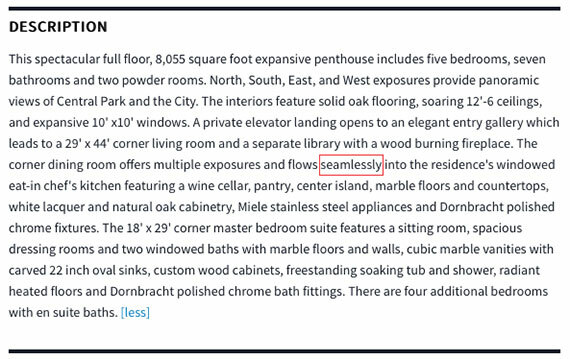 The word “seamlessly” is also a broker favorite, being used to describe everything from the layout of a $9.5 million pad to the location of the dining room in a $76.5 million penthouse at 432 Park. Seamlessly and variants of it appeared 517 times. Words like “seductive,” and “ooze,” are much rarer than one might think, as are “homey,” “resplendent” and “incomparable.” And the word “roommate,” a scourge that most New Yorkers have to deal with, seldom appears in our dataset. Numerous studies show that as the price of a piece of real estate increases, listings get longer and the diction is skewed toward words felt to convey attributes of luxury and exclusiveness. In the $30 million-and-up range, TRD certainly found some colorful examples, such as a listing that describes a $75 million penthouse at the Upper West Side’s San Remo co-op as “the embodiment of the last unicorn of Manhattan.” Despite that language and the fact that it’s owned by Hollywood goddess Demi Moore, it has languished forever on the market. Greg Carlson, a linguistics professor at the University of Rochester who studies advertising campaigns, said the frequency of “custom” is telling. “Once that house is sold, it doesn’t help you sell other houses,” he added. The question is, do all these linguistic gymnastics pay off? Search engine optimization results could be a helpful metric to measure how effective word selection is in driving visitors to a listing. While brokerages and StreetEasy were reluctant to reveal details of their practices, they did say SEO is an integral part of the process. Jared Cohen, the marketing director at Town Residential and a former Mad Man at TBWA, said making sure a listing is SEO-friendly is just one piece of the strategy for in-house copy department he’s built at the brokerage. “In an agency world, the way the copy department works is you get briefed on what the client’s requirements are and what is in the world of marketing called the ‘reason to believe’: the bullet points you want to make sure are communicated in the ad copy,” he said. Avoiding cookie-cutter terms and overly flowery language is generally the way to go, he added. A listing Cohen said he believes really pops is one his team wrote for a $13.5 million duplex at the Ritz Carlton in Battery Park City. Looking to SEO terms does have its limitations, though. While analyzing web traffic can tell a broker which terms draw eyeballs to a listing, it says little about how shoppers react to what they see. What the real estate industry could use is a tool that analyses and alerts listing writers to the hidden meaning in their language. One such example exists in the world of online job searching. Textio, a Seattle-based firm, built an interactive site that helps workplaces finesse their job postings to attract top talent. People are likely to be turned off by words such as “ninja” and “rock star” in job posts, the firm found. The database hinges, however, on industry sources providing information. Mark Liberman, a linguistics professor at the University of Pennsylvania, said Textio’s method could provide insights into what makes an effective listing. Carlson, the University of Rochester professor, said even the most inventive language can fall victim to its own success.